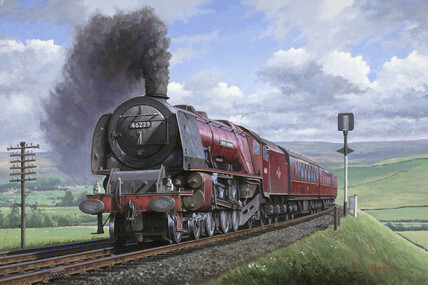 Oil painting by Mike Jeffries of 2004, depicting the 'Duchess of Hamilton' Stannier Pacific C46229 pounding up with Anglo-Scottish Express, c 1960s. 'Lode Star' No 4003, running along the sea wall at Dawlish, early 1930s. Flying Scotsman leaving York Station, c 1930s. 'Mallard', LNER No. 4468, steaming into King's Cross, London, late 1930's. 'Black Five' leaving Saxelby Tunnel with an express for Nottingham, c 1950.